We all want to bath and drink clean water, but what can we do as homeowners with all the chemicals being put into our water system? What is a safe and affordable solution? There are lots of products on the market, but most of these systems are simply not an option for many households due to price and high maintenance costs. Who wants to buy a costly system that a specialist has to come out and maintain for them? We have partnered with an amazing company called Nuvo H2O. This is the system we put in our homes and it is the first system we recommend to clients who want a hassle-free water softening and filtering system that will extend the lifetime of their plumbing fixtures and won’t have them dumping bags of salt and wasting water. Complete system for Homes from 2000-5,000 sq. 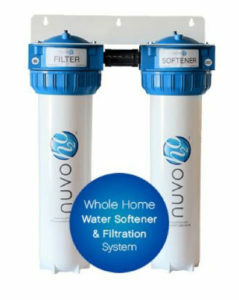 ft.
NuvoH2O combination softener and filter not only prevents hard water build-up and removes existing scale, but provides great tasting water for your whole house. At Robins Plumbing, Inc in Phoenix, our local plumbing company is passionate about helping people find the best water treatment systems for their home or business. If the NuvoH20 Complete Systems sounds like something you’re interested in, contact our plumbing team today. We also specialize in Nuvo Water Systems, Nuvo Manor Systems, Nuvo Home Systems, and Nuvo Studio Systems. In addition to water treatment systems, we also offer residential and commercial plumbing services to help remedy plumbing problems in your home or office. From drain cleaning to backflow prevention and commercial and residential jetting services, we can help. Get your free estimate from our local plumbing company today!